LED lighting offers many advantages over traditional lighting sources. The biggest includes savings to you on their cost over their lifetime as well as noticeable savings on your power bill. That’s because Energy Star approved LEDs offer 90 percent more energy efficiency and last nearly 15 times longer. With a wide range of shapes and sizes tofit pretty much every type of fixture out there, there’s no need to consider any other type of lighting. This lighting technology may seem technical. But LED simply stands for light emitting diode. A diode contains an anode and a cathode. When electricity flows through the diode in a semiconductor it emits light. To prevent performance problems in this technology, the heat LEDs generate go through a heat sink that dissipates it away from the device. A heat sink regulates the LED temperature, so it performs at optimal levels. This “thermal management” ranks as the most important factor in the success of the LED over its lifetime. This varies from a CFL or compact fluorescent lamp or light. In a CFL, an electric current travels between electrodes at each end of a tube containing gases. This causes a reaction that gives off ultraviolet (UV) light and heat. The UV light becomes visible light when it hits a phosphor coating inside the bulb. Incandescent bulbs, on the other hand, produce light when an electrical current heats up a wire filament so hot that it begins to glow. The visible light is known as incandescence. Incandescent bulbs release 90 percent of their energy as heat. Generally, LED lighting products offer more efficiency, versatility and last longer. LED products produce light about 90 percent more efficiently than incandescent light bulbs. They possess greater efficiency because LEDs emit light in a specific direction, known as a directional light source, whereas incandescent and CFL produce light and heat that spreads in all directions. This helps LEDs use light and energy more efficiently with one LED light bulb producing the same wattage as 60 incandescent bulbs. LEDs offer a tremendous advantage over traditional lighting by coming in a wide range of shapes and sizes to fit pretty much every type of fixture out there. Besides LEDs energy efficiency, they save money by lasting up to 15 times longer than traditional lighting sources. In fact, LEDs can last more than 60,000 hours, compared to 1,000 hours for an incandescent light bulb. Additionally, LED lighting can produce colors that include amber, red, green, and blue. This occurs by combining or covering LEDs with a yellowish phosphor material. This independent government testing and rating service gives consumers a peace of mind by ensuring high quality LED lighting. 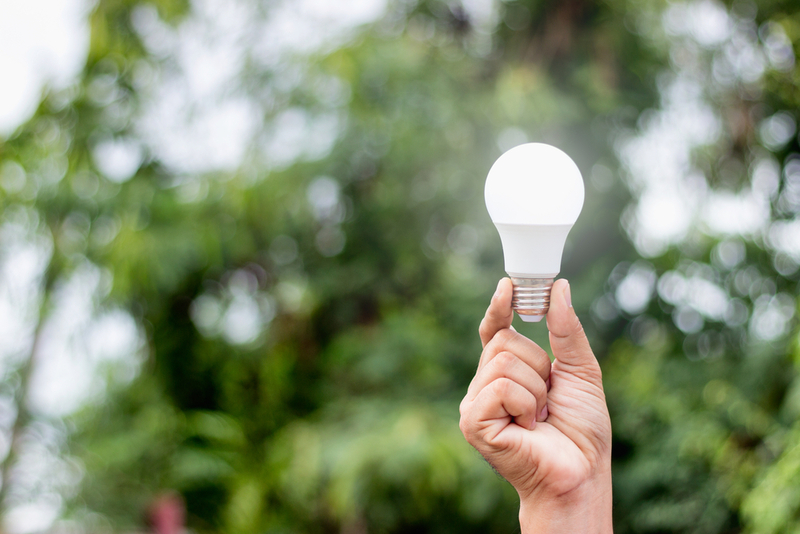 Energy Star reports that LEDs must prove brightness, light output over an extended time, color quality, efficiency, instantaneous lighting, the absence of flickering, and an absence of off-state power draw. Energy Star designates each LED on the bulb packaging by color temperature. It includes soft white or warm white meaning it performs ideally in most indoor applications. Neutral white or cool white operate best in kitchens and work spaces. Meanwhile, daylight, the color of a clear blue sky, work well for reading. Additionally, Energy Star reports that it verifies LEDs compliance with more than 20 requirements to address performance and labeling; does long-term testing to back up lifetime claims; performs testing to stress the products in similar ways consumers would use them at home; and imposes a 3-year minimum warranty requirement. Call Henderson Electric to Help with Your Lighting Needs! For your commercial or residential lighting work, call Henderson Electric today! We will ensure your spaces offer just the lighting you need.